Few would accuse San Francisco’s political columnists of objectivity: scribes like the Examiner’s Ken Garcia and the Chronicle’s CW “Chuck” Nevius are paid to have an opinion. That said, media members must still walk a fine line. Politically-involved columnists and editors must think carefully how to act to avoid losing all credibility, whether it’s endorsing one’s self in a newspaper one publishes, or accepting an invitation to speak at a fundraiser for a partisan political organization that just so happens to agree with your columns (or vice versa) 95 percent of the time. The latter example comes straight from Nevius. The moderate Chron columnist — once described by the SF Bay Guardian as a suburban twit — was scheduled to be the keynote speaker at a $200-a-plate fundraiser, held for the benefit of the Coalition for Responsible Growth. The CRG is a group that in 2008 backed moderate candidates for city supervisor over progressive candidates. The Coalition describes itself in its mission statement as a group which “engage[s] in candidate electioneering and take[s] other political action,” ostensibly to ensure that “S.F. takes a hard turn to the right,” to quote a letter from then-chairman John Keogan, rallying the troops during the 2008 campaign. To readers of Nevius’s columns, his presence at a fundraiser surrounded by like-minded moneyed interests and voters isn’t too surprising. In fact, it’s intellectually consistent: Nevius has banged the drum for every moderate cause celebre in recent memory, from quality of life issues like the sit-lie ordinance to pro-development stances in favor of big downtown towers 555 Washington (and don’t get us started on his voluminous coverage of sandwich shop-turned wedge issue Ike’s). But it’s still questionable ethics for a journalist, objective or otherwise, to be the main draw for a political organization, that will in turn use the funds the journalist’s presence helped to raise on election campaigns. When contacted by the Appeal, Nevius directed inquiries to Steve Proctor, the Chronicle’s Managing Editor. Proctor hadn’t heard about Nevius’s political side-showing until the Appeal’s e-mail, he said. Had he known beforehand, he would have told his columnist not to attend. As it is, Proctor asked Nevius on Tuesday afternoon not to make the appearance, he told the Appeal, and his columnist agreed. “Chuck is paid for his opinions, but this is a slightly different circumstance,” said Proctor, who said that while it’s perfectly acceptable for a journalist to attend a political fundraiser, it’s not OK for a journalist to participate in one. Wondering if we’d ruined the evening for the CRG, the Appeal rang the telephone number listed on the CRG’s Web site seeking comment Tuesday afternoon. A woman answered who did not identify herself before saying she could not comment but would pass on our message to someone who could. Our message was not returned at publication time. 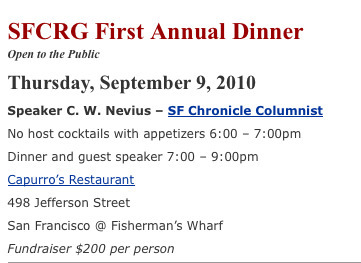 As of Wednesday morning, Nevius was still listed as the keynote speaker on the CRG’s web site.